A few weekends ago I had the opportunity to be assistant coordinator at Phil and Hadley’s Wedding with Shauna of Paisley Promotions. It was such a fun experience, and because of that, I am going to make sure it’s not the last time I get involved in something like it! I had a blast working with Shauna and loved how the whole wedding came together. I can’t take credit for the amazing planning that went into it, that’s all Paisley Promotions, but it was really fun to help make the dream into a reality! The couple was adorable and down to earth and their rustic, boho inspired wedding was pure simplicity at its best. Madeline Druce captured the whole night and if you haven’t heard of her, check out her work, it is amazing! Just look at these two shots that she captured of the bride and groom. 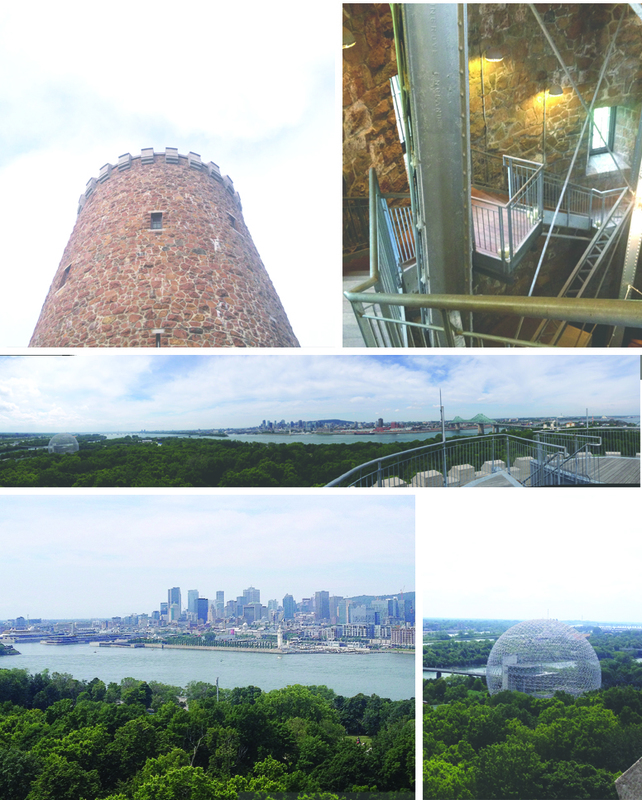 The couple chose a gorgeous spot on Parc Jean Drapeau that is home to the Tour de Lévis, a 1930’s historical landmark, which if you can handle walking up the 157-step staircase to the observation deck, will dazzle you with its breathtaking 360-degree views of the river, downtown Montreal, the biosphere, the beautiful Jacques Cartier bridge and all the surrounding areas. I definitely felt it in my legs the next day after walking up and down those stairs several times throughout the night. Great workout! When I first saw the site a few weeks before the wedding I had a hard time imagining how it would all look, which was frustrating because I am usually really good at visualizing, but aside from the tower; the piece de resistance, it was a very basic, open space that almost resembled a camp ground. As the tents began going up though, the pieces of the puzzle started coming together, and I began to see that it was going to become a very magical space, and it did. It went from nothing special, to spectacular in a few hours. It’s amazing how a lot of creativity, careful planning and hard work can do that. The ceremony took place in a clearing in front of the tower that was surrounded by trees, brush and grass. Bohemian carpets were laid down for people to sit on and rose petals formed an aisle for the bride and groom to walk down. Phil and Hadley stood under two cherry trees that drooped to form a canopy under which they said their I do’s. Dinner was served in a large tent with huge rustic wood tables and chairs, simple wild flower centrepieces and magical string lights that warmed the tent with a gentle yellow glow. After dinner and some dancing the cake was cut in front of the tower and the bridal party made their way up the many stairs to the observation deck. 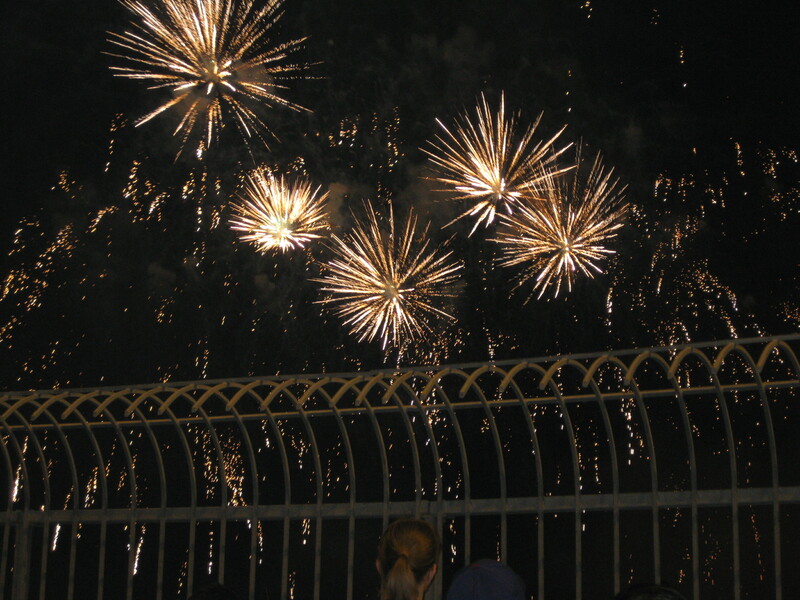 There, they all had the perfect view of the fireworks going on at La Ronde that night. It was all very romantic. The rest of the evening was spent dancing the night away under an open tent adorned by more magical string lights and a bar that kept the drinks flowing. Once everyone had danced enough to feel hungry again, dessert was served inside the medieval tower. The rain held off until the early hours of the morning when no one cared about the way they looked anymore, they were just happy to feel a nice breeze and some cool, wet drops on their faces. Everyone seemed so happy and carefree and the night really couldn’t have gone any better from my point of view. Often it’s the simpler things in life that end up being the best things and this wedding was a testament to that! 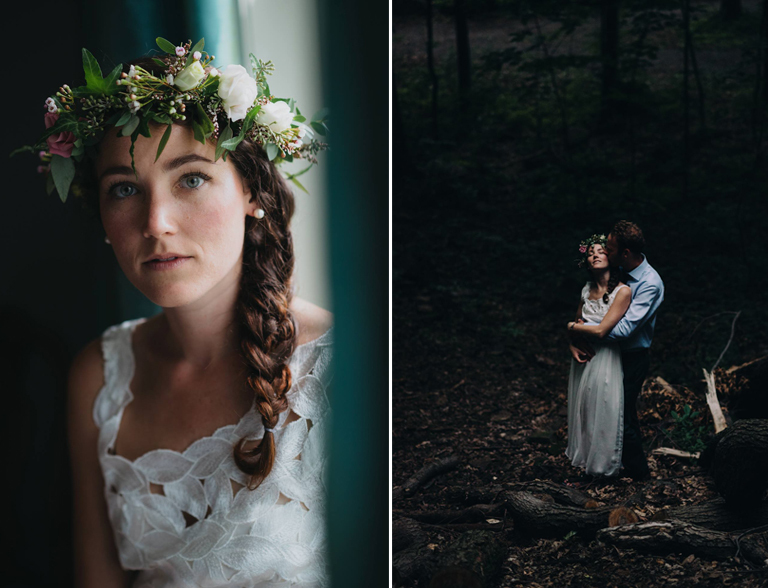 I love how so much work went into making the night feel effortless, relaxed and simple. It just proves a job well done. Special thanks goes to Dansereau Traiteur for the incredible food that night. Every little thing was beyond delicious and the presentation was phenomenal, and to Eventex for going above and beyond their mandate that evening. Amazing work. Side note: My photos were all taken on the fly with my iPhone camera so while they aren’t of the best quality, they do manage to give a good idea of the vibe of the night! I have been noticing lately that it’s the simple things in life that make me most happy. For example, this past weekend, after spending the day at Osheaga (a popular Montreal music festival) which in itself was extremely enjoyable, we decided to avoid the huge line for the stuffy packed metro by walking home instead. The walk was long and consisted of crossing the Jaques-Cartier bridge, but it was the perfect summer evening for it. To 0ur surprise, it was the final night for the international fireworks competition and we caught it from the bridge! I had been trying to catch a show since it began over a month ago and something always got in the way, so you can understand why it was an amazing treat to be able to see it as a surprise. Not to mention, we got the best (free) seats in the house! Do you find the simpler things in life to be the most fulfilling as well?